Brianne (my almost-4-year-old) is obsessed with Star Wars. To my husband’s delight, she totes around 2 of his old Storm Trooper toys that were found at Grandma and Grandpa Bucher’s house, and refuses to answer to her own name. On and on it goes. She’s even got her little sister…who can barely talk…pretending to be R2D2. “Mom! Did you hear Lo Lo!?!? She said R2D2!!!! !” Yay. Sure enough, down the hall I heard the faint robot-voiced Lo Lo coming towards the kitchen. “I um a bobot…bee bee boo boo…I um a borot…boo…I uma a bobot…R2D2” Yay. All day long it’s a battle between her and I. She trying to persuade me to call her C3P0 instead of her real name. Me, trying to think of a way to get her to lay her sales pitch to rest for 5 seconds and put her coat on to go to school…or eat breakfast…or wash her hands…get dressed…just about anything. I really figured Star Wars would still be over her head, but man have I been proven wrong. 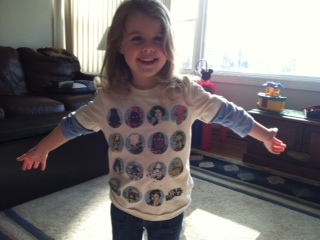 I found a ‘vintage’ Star Wars T-shirt at Target…with every character on it…and now have to wash her new prized possession every other day so she can wear it. (Yes, I HAVE to…its just easier than the constant whining in my ear…it just is.) I’m sure it will soon be paired with a tutu of some sort…give her time. Of course, she wanted to show it off to her pre-school friends as soon as it we hit a day it was clean and ready. 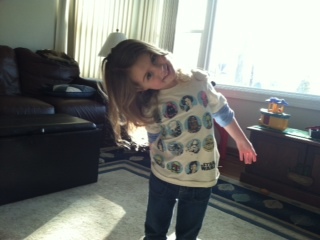 Running late, she decided to race her best bud into school today and fell down…a tragedy that- for a moment- overshadowed the excitement of revealing C3P0 and the gang on her new shirt. After a 10 minute consoling session trying to convince her that she should still go to school (literally just a scratch…not even a speck of blood…and she inspected it for some…believe me. )…I finally remembered to channel the power of the force. “But, Brianne, your new Star Wars shirt…don’t you want to show everyone?” I said. Her Daddy thinks it’s hilarious, for many reasons, I’m sure. And I can’t help but catch the slight tinge of relief in his voice at the sound of her begging to be called C3P0…and little robot Lo “bee-booping” in the background. He must be thanking God his entire existence will not be full of pastels, princesses, tutu’s, and Barbies. There will be fleeting moments when his little girls will be begging him to get his old Star Wars toys down out of the attic…instead of Mommy for her Barbies and Raggedy Ann and Andy dolls (which, thanks to an inaugural thrift store trip we will be doing today…). 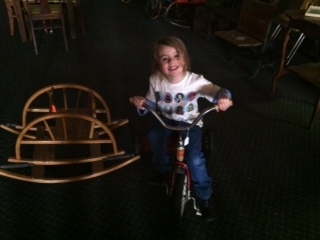 Riding a really old tricycle at the thrift store...wearing her Star Wars shirt, of course. I’m glad he gets a taste of it…passing down your own toys to your kids. Watching them be excited about the things you once were fascinated with. Toys you took care of, and couldn’t wait to show your friends. It’s a big way we connect with our kids. It’s why every parent tears up at the end of Toy Story 3…oh, don’t lie about it. It’s true. Aware that I’m a broken record, I’m going to say it again. Time is fleeting. Fast. Even though I get frustrated with the robot talk and the alter robot egos around here…I’ll pacify them, and eventually cave. My daughter knows when she’s frustrating me. It’s her job to find those buttons and push them, I guess. But it’s the bond that forms when she knows I’m tolerating it anyway…playing along even though I really don’t feel like it…that makes it all worthwhile.